Please note that these courses are aimed at Japanese language teachers who are non-native speakers of Japanese. If you wish to learn Japanese but are not a Japanese teacher, please click here to read about our general Japanese language courses. 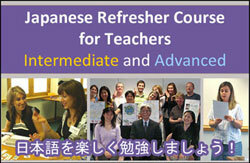 If you are a native speaker of Japanese, please click here to view other courses that may be of interest. Open to: Non-native speaking teachers of Japanese, as well as teachers and PGCE students who have the chance to offer Japanese in future. These courses are designed to increase confidence in Japanese; develop your speaking, listening, reading and writing skills; and further your knowledge of Japanese culture. Open to non-native speaking secondary and primary teachers of Japanese with Japanese language skills, this is the perfect opportunity to enjoy small-group tuition in a supportive atmosphere. Click here to a read a report of the 2014 course. Click here to read a report of the 2013 courses. Click here to read a report of the 2011 courses.